Show your Hoosier spirit in this ADIDAS knit scarf in crimson & white stripes. 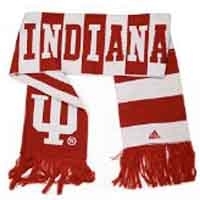 This scarf has vertical stripes on one side with INDIANA in alternating colors with IU logo imbedded in the crimson knit. On the alternate side, there are horizontal stripes with a center HOOSIERS along with INDIANA on the end of the scarf. Finished with crimson fringe. T GO HOOSIERS! This is a scarf is just right to keep you warm in spirit and body!